Al Jazeera reports on the Philippines elections on polling day. With 87.5 percent of precincts already accounted for, Davao City mayor Rodrigo Duterte, is unofficially presumed winner of the 2016 presidential elections in the Philippines, reports Rappler. According to the unofficial and partial results from the Commission on Elections’ transparency server, Duterte had 14,680,126 votes or 36.6 percent of transmitted votes early today. Duterte enjoyed a decisive lead ahead of Liberal Party (LP) standard-bearer Manuel Roxas II and independent candidate Grace Poe. While Roxas and Poe had been switching ranking since precincts closed, Duterte has never once been dislodged from the top spot. Duterte is expected to hold onto the top stop as the remaining provinces that are yet to complete their transmission are not vote-rich. The PDP-Laban standard-bearer’s performance in the polls (36.6 percent) surpassed results of voter preference surveys, where he peaked at 33 percent with margin of error of +/-1.5 percent. “It’s with humility, extreme humility, that I accept this, the mandate of the people,” Duterte said in Davao City, which he has ruled as mayor for most of the past two decades. 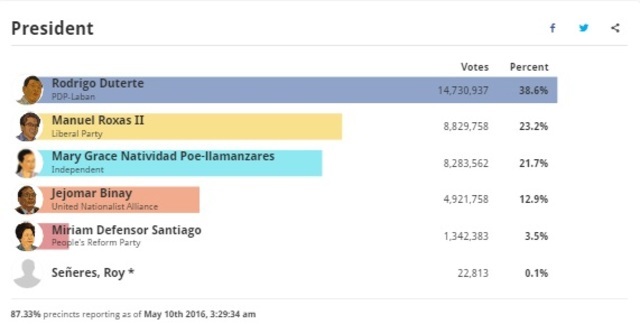 Administration candidate Leni Robredo continued to retain her “hairline” lead over Ferdinand “Bongbong” Marcos Jr based on partial, unofficial election results from the Commission on Elections transparency server. With 90.84 percent of precincts reporting, Robredo had 13,364,461 (35.0 percent) votes while Marcos had 13,194,150 (34.6 percent) – or a difference of 170,311 votes. Just hours before polling began yesterday, seven people were shot dead and another was wounded when a convoy of vehicles was ambushed, police said.